This species is characterized by a rather smaller diversity of physiological and commercial characters if compared with white and narrow-leafed lupins. However, it may also be divided into different geotypes, ecotypes, eco-geographic groups of ecotypes and concultivars on the basis of variation in productivity of green matter and seeds, duration of vegetation period, predisposition to vernalization, seed weight, etc. Yellow lupin probably originated, according to Gladstones (1974), in Portugal and western Spain, whence it was distributed as cultivated and horticultural plant. Merino (1905) observed that plants of yellow lupin in the Spanish province of Galicia are often clustered around villages, which underlines the role of cultivation in the distribution of this species even within its present natural range. In the same way (by semi-naturalization) it appeared on the Island of Madeira (Lowe, 1968) and in the west of France, in Southern Africa and Western Australia (Gladstones, 1974). Yellow lupin is cultivated as fodder crop on acid and, basically, sandy soils in Belarus, Russia, Ukraine, Germany, Poland, Brazil and other countries. 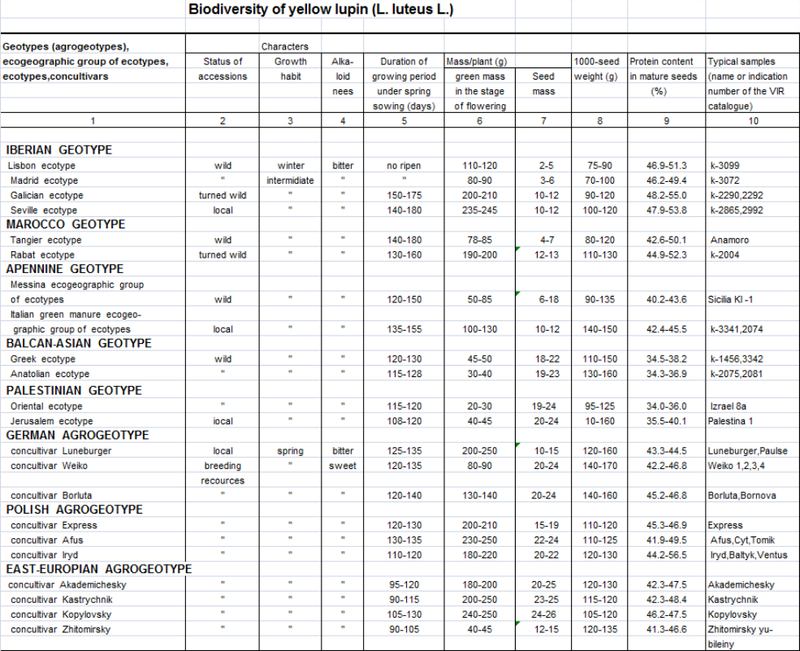 The diversity of yellow lupin is classified into 8 geotypes, 10 ecotypes, 2 eco-geographic groups of ecotypes, and 10 concultivars. The full description of each of resulted in the table ecotypes, genotypes and concultivares are published (Kurlovich, 2002), and Online here.